We trust that you will take the time to check out our products and services. Do not hesitate to contact us if you require additional information. Image House Digital specializes in printing large format digital images for the trade show industry. Our expertise in printing for trade show perfectly complements our line of premium quality trade show display hardware. Since our inception in 1995 we have endeavored to use only the best and very latest techniques, equipment and inks to deliver world class interior large format print and display products. 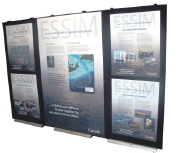 This is our premium non-retractable banner display system which can be single and/or double-sided. These banners can be used as stand alone, single or double-sided, table top or extended height displays, and can also be used as a backwall system and are available in 30, 36 and 48 inch widths. The Para-Post graphic offers virtually no edge curl and is thicker, is 100% opaque and is a more durable banner material than other banner systems. The end user can change or update the graphic(s) without having to send the system to the supplier. The hardware has a lifetime warrantee. © Copyright 2008 Image House Digital Inc.